A team of researchers has found a key player in brain tumour formation that may lead to new therapies for a deadly and incurable cancer. The study published in Nature Neuroscience is the first to show that a protein called OSMR (Oncostatin M Receptor) is required for glioblastoma tumours to form. Glioblastoma is one of the most deadly cancers, resistant to radiation, chemotherapy and difficult to remove with surgery. 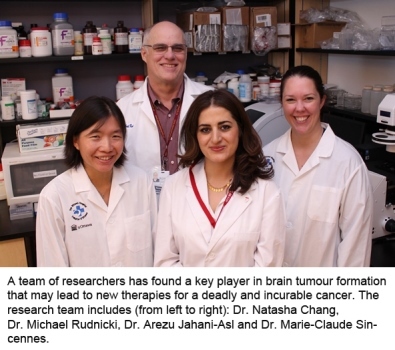 “The fact that most patients with these brain tumours live only 16 months is just heartbreaking,” said Dr. Arezu Jahani-Asl, the lead author who performed this research largely in Ottawa while she was a postdoctoral fellow co supervised by Dr. Michael Rudnicki at The Ottawa Hospital and the University of Ottawa and by Dr. Azad Bonni from Harvard Medical School and Washington University School of Medicine. “Right now there is no effective treatment, and that’s what drives me to study this disease.” Dr. Jahani-Asl is now an assistant professor in the Department of Oncology at McGill University and a principal investigator at the Jewish General Hospital, with a laboratory dedicated to how glioblastoma develops. 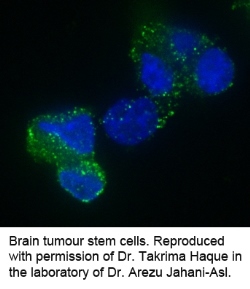 The research team studied human brain tumour stem cells taken from glioblastoma patients. While it was previously believed that any cancer cell could reproduce to form a whole tumour, researchers have since learned that in brain cancer only a few kinds of cells have this ability. If a single one of these brain tumour stem cells is left behind after surgery, it can create a whole new tumour. The team found that blocking OSMR activity in these cells prevented them from forming tumours in mouse brains. Dr. Rudnicki is the Director of the Regenerative Medicine Program at The Ottawa Hospital and a professor in the Department of Medicine at the University of Ottawa. He also holds the Canada Research Chair in Molecular Genetics. When the research team looked at 339 tumour samples from human glioblastoma patients, they found that the higher the OSMR expression, the faster the patient died. This was confirmed in mouse studies, where animals injected with human brain tumour stem cells with low OSMR expression lived 30 percent longer than those infected with tumour stem cells with normal OSMR expression. Researchers already knew that an active form of the epidermal growth factor receptor called EGFRvIII drove tumour formation in glioblastoma, but so far therapies targeting this receptor have not worked against brain cancer. Dr. Rudnicki and his team learned that EGFRvIII needs to bind with OSMR before it can send out any tumour-forming signals. This new understanding could pave the way for more effective treatments, not only for glioblastomas, but also for other cancers with highly amplified EGFR expression like breast, lung and cervical cancers. Full reference: “Control of Glioblastoma Tumorigenesisby Feed Forward Cytokine Signaling” Nature Neuroscience. Arezu Jahani-Asl, Hang Yin, Vahab D. Soleimani, Takrima Haque, H. Artee Luchman, Natasha C. Chang, Marie-Claude Sincennes, Sidharth V. Puram, Andrew M Scott, Ian A.J. Lorimer, Theodore J. Perkins, Keith L. Ligon, Samuel Weiss, Michael A. Rudnicki, and Azad Bonni. April 25, 2016. Funders: Canadian Institutes for Health Research, US National Institutes of Health, the Mathers Foundation, and The Ottawa Hospital Foundation.